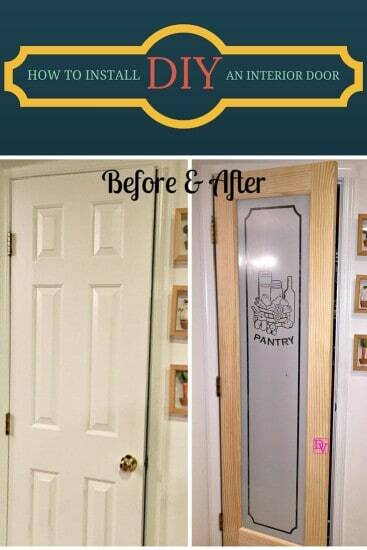 You know I just can’t go too long without a new DIY project, and it was time for the old pantry door to go! The door just does not work with our current kitchen decor. Poor Michael, it meant time for a new install but also an excuse to crack out his favorite tool bag filled! Today’s install was painless. We actually got done much quicker than I thought, thanks to my husband’s DIY skill. I cannot believe how much he knows and I learn more with every project we tackle. Lavishly live DIY out loud and join us in this DIY of how to install an interior door for a pantry. We had a plain old white door and it was just there, and with all of the upgrades we have been doing in the house, and all the upcoming changes in the kitchen(details to come) it was time to get the old pantry door out and replace it. Our choice was a solid wood door that has frosted glass in the middle section of the door. We went online, ordered our door and now the door I have wanted since we built the house. You see the door I chose was not a ‘builder option’. The door I ordered is a Michael and Dana option and thus it has become a DIY. Here is my old pantry door, it is just silently there. I am not a fan of it, but it has served its purpose over the last 8 years, but Out with the Old and In with the new is how we DIY people like to think of things! Did you ever notice there are a lot of choices for doors in the stores, but no that many online? How do you buy a door online? That is the easy part when you find a reputable company that offers quality products. I guess I could have just chosen a new solid wood door, but that did not hit the ‘want’ list because forever I have seen doors that say ‘Pantry’ and I wanted one. I love online shopping because it ships right to the door, no hauling required. Here is the door that I chose. Now before I go any further, take a look at the DIY Process, it is really easy and if you have basic tools, you can do the same! Here’s How To Install An Interior Door. Take note of all the hardware, because right now the site just is shipping the doors. We went to a major home improvement retailer and purchased door knobs and hinges. You will need about 1 to 2 hours to get the project done from start to finish, it is really not hard at all. Remember the door will need stained or painted to match your area. 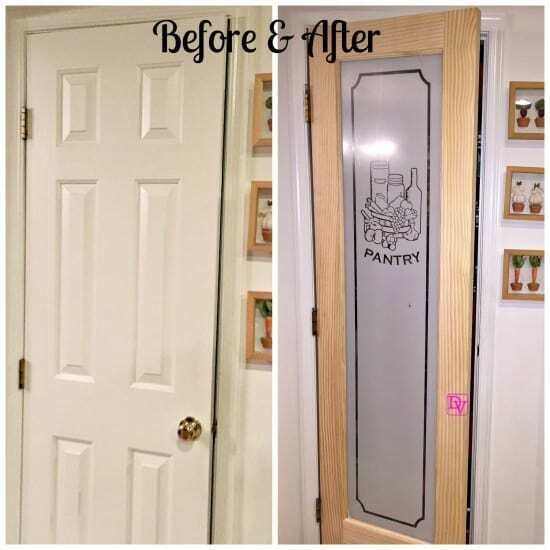 Your End Result In hanging a new interior door looks like this! It took us only a few hours, but we did this over a few different days because we both work full time and manage kids. This is a basic install with no hidden problems. We measured and had in mind what we wanted it to look like and I bought a new doorknob. I love the before and after look as it is quite gratifying and now all we have left to do is to stain it! Lavishly live DIY out loud and join in on all of our projects and make sure to try your hand at installing a new interior door. Great information. I get the useful information. Your blog is very helpful for me. Thanks for sharing. Hey, Dana! Thank you for the article! And thank you for the idea about an interior door. Yours looks great! Thanks for sharing this post! The result is great! Measuring is indeed the most important thing for any DIY project… Learned from experience 🙂 Bookmarking this post for future references. 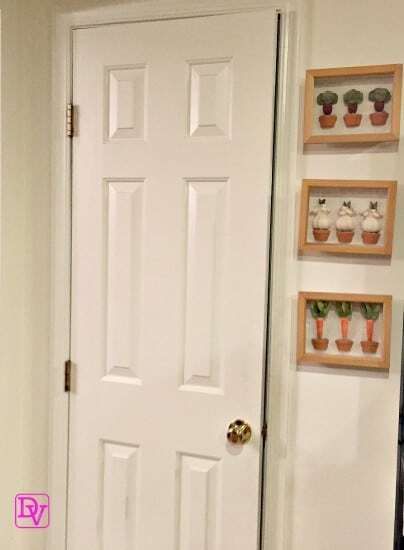 I’ve never installed an interior door before, but if I had to, these are some good ideas! Thanks for sharing about this. Shannon Gurnee recently posted..Flash Giveaway – $20 Paypal Cash!!! I love that pantry door! I may have to check out Door to Door when we get ready to redo ours. I don’t think I will attempt to so this on my own, but this is good to know. My husband and I are not a handy couple but we are planning to do some home improvements at home. And this will really help us. 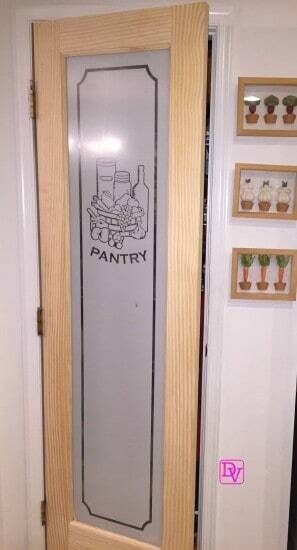 This is a great pantry door! It really changes the whole look of your kitchen I bet! Shaylee recently posted..Our Top 5 Tablets of 2015 Are Here, And You’re Going To Want Them All! It’s always nice to refresh a space when it starts feeling tired to you. You came up with a really unique idea! Awesome! I’ve never done this before! I think it’s easy enough for someone like me! Wow this is really cool, and it will make easier when we need a interior door, I’m gonna check the door to door company. I love your pantry door it reminds me of being in a restaurant or hotel very cool! Measuring is key. Buying the right size door is a must.